“oh I might as well go with you”, and she started to get up. I was bringing Moses (dog) to the vet for a recheck and leaving Rookie (other dog) at home. I got ready to go and woke napping mom to let her know I was leaving and that Bob was downstairs in the office if she needed anything. she sat back with look on her face that would break your heart. “well I didn’t think it was that big of a deal, never mind then”. Okay so now I feel like a schmuck…. “oh I’m sorry mom, come on then, come with me, it really isn’t a big deal at all”. All of my my errands take a little longer, require a little more planning and can be a little more stressful. How big a deal is it to take mom with me to do any errands? Well she needs at least her cane and my arm to walk at all and that is if we can park close enough (we do use her handicapped parking permit, only helpful if space is available). She absolutely adores the dogs, however the dogs do not understand how not to always be in the way, so of course I worry that one day one of them will knock her over, again. Even while I’m holding on to her. And mom doesn’t understand that she can’t maneuver the way she use to and she tries to help with the dogs, she even thinks she can hold their leashes and walk them in to the vet office. (she had 5 kids, she did amazing things back in her prime) The car door is too heavy for her to open (she is very weak) so, I try to be sure that I either take the dog out first and risk that she is not trying to get out at the same time with the possibility of the door slamming back on her or I help her out first and hope the dog doesn’t jump over her to try to get out quicker. It happens fast and it does keep me on my toes. As I’ve mentioned before, over the years incontinence has become an issue for mom, (our turn in coming) so we need to be prepared for that. ( that is more than just proximity to a bathroom, often times it means a change of clothes) So as long as I cover those things and I do make sure there is a bathroom close by and that she has tissues for her forever running nose, we can go. It is a slow trip with a little added stress but in the long run how big a deal is it to just bring her with me , I can slow down, heck I should slow down. So she came with me to the vet. I just need to pick up a few things, HA. 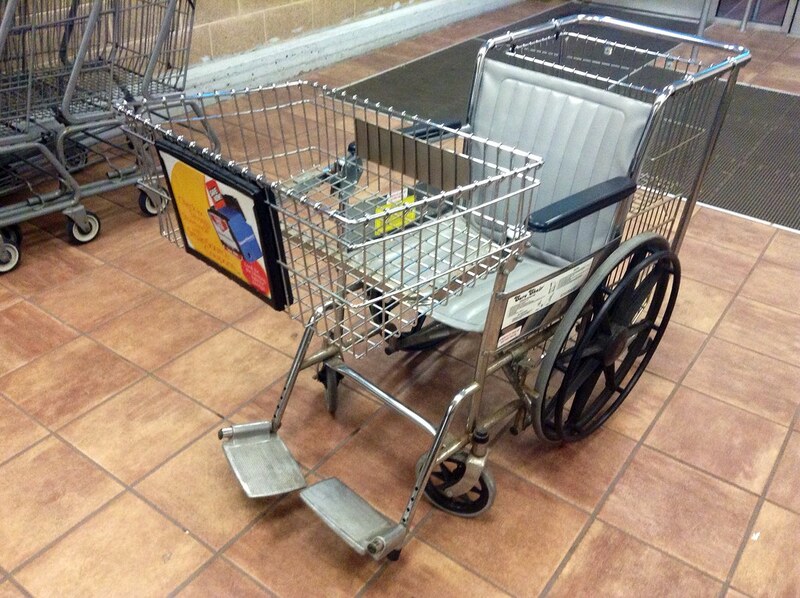 Then we need the right cart to be available; (only one grocery store has it) the cart is a wheelchair with a basket in the back, one in the front that fold down in front of the passenger to lock them in and one underneath in the back. It drives like the carts you use with kids that have the car in front, they are big and bulky and hard to take corners in. If the wheelchair cart is not available ( Market 32 only has 1) I use her wheelchair and drag a carriage or basket behind me. That is a pain in the neck. On a perfect trip, we would park close, the right carriage is available, (they definitely need to have these everywhere) she has tissues for her nose and I can push that cart relatively well now, so we can zip up and down the aisles…….. until ……. So we pick that out, too many choices are difficult for her, so I hold up a couple different brands and flavors so she can choose. Finish shopping, check out “fast”……. Everything in reverse now, put the groceries in the car, get mom in the car, then the wheelchair in the car, unless it is the stores cart, then I always return it to the store because if someone else is in the same situation as I am they will want it available. So we went grocery shopping together like we have done so many times before, just different. Planned trips are different, If she has a doctor’s appointment, then I can make it an event. Last year about this time, well early December, mom had her hearing check, so I decided to tour the beautifully decorated St. Vincent’s, where her appointment was and then take her to lunch. Having the plan , I made it an event. We donned our gay apparel and off we went. We received and gave a lot of smiles and “Merry Christmas’s as we walked/rolled around in our Santa hats. We both enjoyed it. Her hearing appointment was such a small part of our day. After her appointment we went to a quaint little restaurant for lunch (her lunch & dinner ), we had a pretty Christmas “beverage” (she occasionally still likes to partake) We chatted and had a few laughs. It wasn’t bad at all. We enjoyed it. Often times I do complain, not to Mom, obviously, but, to others and to myself. I get annoyed sometimes that errands take so long. I have to admit I can get a little resentful on occasion too. There are times when I just stayed home because I didn’t have the energy to deal with what at that particular moment I think of as an ordeal. There are days when I really do just want to run to the grocery store and grab something quick and come home to relax. There are days I don’t want to go through the ordeal of getting the wheelchair out of the car , or checking for the things she would need. The day will come I know ………where I won’t have to. So for now, I’ll take a little longer to do my errands , and I’ll plan to keep the senior necessities in the car and I will get out our santa hats and smile at others and say “Merry Christmas” because you know why……..